activity (EVA), and setting a new EVA record of 5 . hours. On July 20, 1969, Buzz and Neil Armstrong made their historic Apollo 11 moonwalk, becoming the first two humans to set foot on another world. They spent 21 hours on the lunar surface and returned with 46 pounds of moon rocks. An estimated 600 million people – at that time, the world’s largest television audience in history – witnessed this unprecedented heroic endeavor. Starbooster reusable rockets, and multi-crew modules for space flight. He founded Starcraft Boosters, Inc., a rocket design company, and Buzz Aldrin’s ShareSpace Foundation, a nonprofit devoted to addressing science literacy for children by igniting their passion for science, technology, engineering, arts and math (STEAM) through delivering hands-on STEAM activities and inspirational messages. 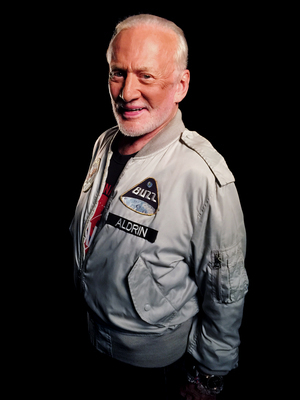 In June of 2011 Buzz started a new company, Buzz Aldrin Enterprises, LLC to promote his brand and oversee all aspects of his public appearances, media, licensing, endorsements and efforts to promote the future of the space program. Making a Home on the Red Planet. He has also authored two space science-fact-fiction novels: The Return and Encounter with Tiber. His non-fiction works include the best-seller historical documentary, Men from Earth, and an early 1970′s autobiography, Return to Earth. His book, “Mission to Mars: My Vision for Space Exploration”, published by the National Geographic Society in 2013, outlines his plan to get us beyond the moon and on to Mars. As one of the leading space exploration advocates, Buzz continues to chart a course for future space travel and is passionate about inspiring the younger generations of future explorers and innovators. Meal menu selections will be made on the registration page.